It has been a long time since I have shared my personal thoughts about something on this blog. So here I am with a post about how Microsoft has affected the journey of my life and how I am even going to make it better by being a Microsoft Student Associate. This post was also required for the registration in the program. I'll be judged on the content of this post and the number of likes and comments on it so please if you like it, click on the like button below so that you can help me to get selected in the program. 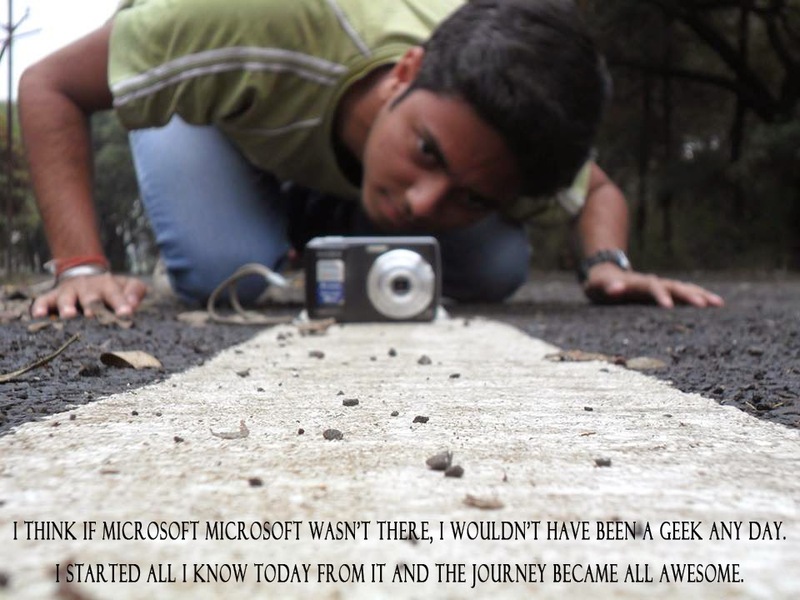 My journey with Microsoft started when I was a little school kid of 3rd grade. This was the time when computer was a distant dream to me and it suddenly came true when the computer science subject was introduced in my school for students from 3rd grade onwards. When I first used a PC in my computer lab, I asked the teacher that why was a wrong flag displayed on the screen. Funnily enough, at that time, India's national flag was the only flag I knew. The teacher told me that it was the logo of Windows 95. I was really amused by it and drew it on my canvas in the arts class that followed after the lab. I still wonder that Windows has so easy to use and user friendly operations that I easily learned them when I was as little as a third grader! I think if Microsoft Windows wasn't there, I wouldn't have been a geek any day. I started all I know today from it and the journey became all awesome. The second Microsoft I fell in love with was Microsoft Office. It has taught me how to feel a graphical user interface in the heart. In less than an year, I started making beautiful presentations, documents, spreadsheets and everything else. I became a hero in my class because of it. I remember in the 8th grade when the social science teacher gave us an assignment to prepare a presentation on the Russian Revolution, I prepared the presentations of almost all my classmates on Microsoft Power Point. ClipArt and WordArt were like my childhood toys. Writing the name of the girl I had a crush on with WordArt and displaying a heart from ClipArt above it was like the best thing to do. When I started programming in BASIC, I never knew that code would become my life someday. It'll always be the first programming language I used. Now I don't remember much of BASIC but the second language I used gave a big boost to my programming interest. And is there a need to name it? It was Visual BASIC. I still name my visual objects like lblOutput and txtNum. It wouldn't be wrong to say that BASIC gave me a strong background of programming and it helped me to become whatever I am in that field. There are many ways in which Microsoft has affected and improved my life and I cannot describe all of them in 1000 words limit. So I'll tell the rest in short..
Gaming got a whole new meaning with XBOX. I couldn't afford one so I used to pay for it on per hour basis and play with my friends at a nearby shop. The review of the Surface tablet became one of the most popular posts on this blog. Windows XP, 7 and 8 are all my favourite operating systems. I have grown up working on these. The Visual Studio and .NET framework was one of my favourite subjects in college and I found developing on these to be more user friendly than ever. How can I change the society being a Microsoft Student Associate? I have many answers for this question. First of all, I am really interested in learning all the Microsoft technologies I know and I am sure I can do wonders with them. I've always known that Windows Phone and Windows 8 app development is the easiest and the most powerful development experience, ASP.NET is one of the greatest web technologies available and Visual Studio is one of the best IDEs ever. I can shape my ideas into awesome products using all these technologies and can make the world a better place. Secondly, attending and coordinating Microsoft's events would give me confidence and experience to the various scenarios of life, and it would be an honour for me to carry forward this experience to others just for the cause of changing the society. With all this experience and teaching, I'll be a better human and would serve the society better. That's all I have in this post. Stay tuned to WeboGraffiti for more technology.